Sleeping better with the help of music - is it possible? Are Our Brains Wired to Use Music As A Sleeping Aid? If you've ever had a problem falling asleep or remaining asleep throughout the night, you'll know how debilitating this can be in the long run. A lack of quality sleep affects your whole life - from how accurately you are able to respond to stimuli on the road, to how well your body metabolises the food you eat and how you perform at your job. As such, it makes sense that individuals who suffer from insomnia and other sleeping disorders often turn to pharmaceutical formulations to help them fall asleep. However, these medications are seldom prescribed for a long duration and can have a variety of adverse effects on the human body - even to the extent where it might permanently impact on your body's natural ability to fall asleep. So, what's the answer? Listening to restful music before bedtime could provide a solution. It turns out there's more to music than we might think. Our bodies relate to music via the parasympathetic nervous system, which also plays a pivotal role in how our bodies relax and prepare for sleep. 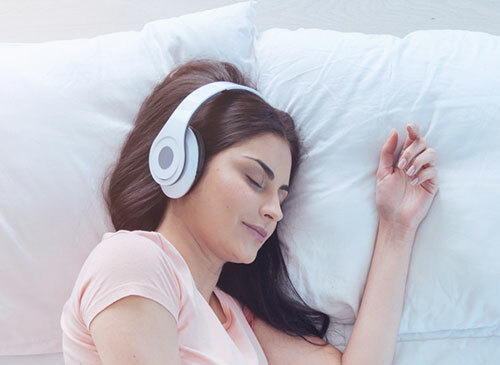 Studies have found that adult individuals who listen to between 30 minutes and one hour of relaxing music before they go to bed report that they fall asleep easier, enjoy a longer night's rest, sleep through the night and wake up refreshed. Young adult respondents reported that classical music had a similar impact on their sleep patterns. The best music to enjoy before bed will depend on your own taste, but try to find pieces that feature 60 to 80 beats per minute (BPM). Choose your bedtime soundtrack and stick to it - the more frequently you adhere to your routine, the more effectively you will cue your body to prepare for sleep. Before long, you will start yawning as soon as you hit play. Do you think you might try music to help you sleep sounder at night? While you’re in the process of tailoring your sleeping environment, we highly recommend taking a look at your bed, mattress and bedding. The surface you sleep on plays a vital role in setting the stage for high quality sleep, so it might be time to invest in an upgrade. Keep an eye on the blog in coming weeks and months for more interesting, sleep-related info. In the meantime, feel free to get in touch if you have any questions regarding our wide selection of comfort-graded sleeping surfaces.